As I mentioned yesterday, not every filmic presentation of HAMLET is wholly the play by Shakespeare, just like the play and novel adaptations are not! The first is The Lion King. While not so clear at first (and certainly with much happier music), the plot of the prince usurped by his evil uncle is a none-too-clear adaptation of the Revenge Tragedy (turned comedy). Would Hamlet have trusted Rosencrantz and Guildenstern more if they had been more like Timon and Puumba? Next, I grew up with the BBC Animated Tales of Shakespeare (some now found on YouTube). These 25 minute adaptations starring some pretty famous folks (Tilda Swinton is Ophelia) are incredibly artistic presentations. Each animation decision has a clear purpose – especially for this Hamlet. The team decided to utilize stop-motion-like oil painting on glass, a technique at once both precise in shape and blurry in action. The world is full of Escher-like passages and stairwells, and occasionally we cannot see the character speaking – only hear their voice echoing down the cavernous hallways with their footsteps. It is understated and eerie, and – to me – perfect for Elsinore. I’ll be discussing more of these animated tales in future posts. Briefly I’d like to mention Hamlet 2 – while really not an adaptation of the play, you’ve got to admit that a sequel to the tragedy involving a time machine, musical numbers, and Jesus is… well it’s something. Also briefly, the RSC’s Complete Works of William Shakespeare (abrgd) spends all of Act 2 in Elsinore. And it’s from them that we get our 32 second Hamlet for the Festival! I also have to mention Slings & Arrows – an incredible Canadian TV series that looks at how a large theatre works from the inside. Season 1 is all about Hamlet (and the actors themselves), and how even with nothing, and almost no rehearsal time, the magic of Shakespeare’s words in the Theatre is a beautiful and inspirational experience. However, due to many adult situations and bad language, please do not show this in your classroom! These are wonderful examples of how this play can be seen and discussed from different angles. If your students are performing a scene, encourage them to film their rehearsals, and see how their discussions might mirror those in Slings or Midwinter. How do we adapt stories to fit what we know today? How might we perform this play taking inspiration from these films? Films offer directors and actors a chance to take their ideas either to a totally unrealistic setting and space, or to make the piece entirely real. Both Michael Almereyda and Franco Zeffirelli accomplish the later with their heavily realistic films in the modern day and in a medieval castle. Their actors are able to speak to themselves and each other privately, intimately, and are ultimately devoid of screen “tricks.” The audience can accept everything about the world the characters inhabit because it is so complete. Somewhere in the middle of the spectrum lie Branagh’s and Olivier’s versions. Both Hamlets reside in a world that is an in-between place. It might be in another dimension in time, but is not viewed as “of this world.” Olivier’s Elsinore is covered in mist, and makes great use of voiceover so that the whole play almost seems to take place inside Hamlet’s Freudian-influenced mind. Branagh’s epic film seems to be set just shy of the turn of the 20th century, yet the lavish, rich decor and colors set it apart from reality. Also to be found on film are staged versions (or adaptations of staged versions for film) of Kevin Kline, David Tennant, and Richard Burton. Even just watching the same speech as imagined by these actors and directors is incredibly different. Obviously I could go on and on, but I invite you to preview these films and discuss how they can help us as teachers (or students) relate to the text in a different way. Where would you have set Hamlet? What would the world look like? How would you discuss the play with your students after having seen some or all of these films? 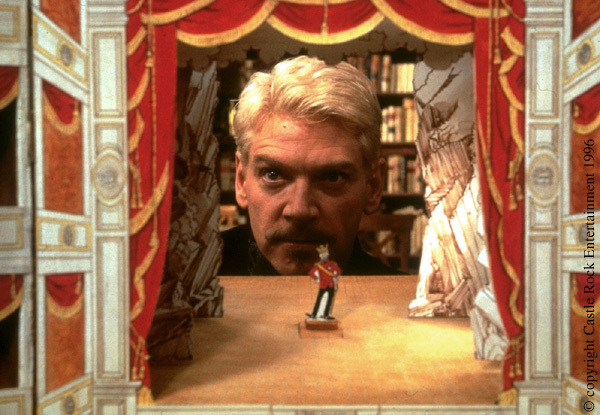 Tomorrow I will be offering my “discussion pieces” of Hamlet in film. This is Hamlet month at the Folger. Our production of Hamlet begins previews on April 21st, and it promises to be an exciting one. In addition, Folger Education debuted its new webpages for teaching Hamlet to non-native speakers of English, or ELL/ESL students, this week. Our Shakespeare for ELL and ESL Students introduces teachers to the idea of working with ELL/ESL students, and our Tips for Teaching ELL and ESL Students Shakespeare page is filled with helpful suggestions for teaching Shakespeare. Teachers will find the first two featured lesson plans are focused on pre-reading exercises for getting students ready to read not only Hamlet but any of Shakespeare’s plays. We asked a number of teachers about teaching Shakespeare to non-native speakers. After taking a look at what Carol Petrallia and Christina Porter have put together, what would you add to help ELL/ESL students have a positive experience with Shakespeare’s plays? What have been some of your own experiences working with ELL/ESL students and Shakespeare’s plays? I did this back in January for Macbeth, and do plan on more! Hamlet itself is based on the tale of Amleth, which you can tell almost immediately is the basis for the story when Feng, the brother of king Horwendil, kills the king outright and marries his widow, Gerutha – who already has a son, Prince Amleth, who feigns madness, goes on adventures, and eventually avenges his father. It is also said to have taken inspiration from other Revenge Tragedies of its time, but stands out because of the emotional journey of the hero, Hamlet. Many books or plays about Hamlet choose to examine background or lesser characters, rather than delve into the noble prince’s mind themselves. A more local play to the District is Elsewhere in Elsinore by Caleen Sinnette Jennings. The cast is only women: wives, mistresses, or characters in their own right from Hamlet. The play examines the role of women in the politics of men: Gertrude is abused, Ophelia is coddled, and the fiancees of Rosencrantz & Guildenstern are scheming with the murderous king and his cold hearted queen. It’s certainly an interesting “what if” in the heart of a classic tragedy. Young Adult Novels have been more interested in the women characters in the play, specifically Ophelia. One of my favorite novels based on Shakespeare is Ophelia by Lisa Klein. There is also Lisa Fielder’s Dating Hamlet. Klein’s novel is a bit darker, and even more dramatic in that the events do not really differ from the play’s action – even knowing what is to come you may be surprised at how the characters are interpreted. Fielder’s lighthearted novel is a bit harder to swallow, but who doesn’t want a happy ending for Hamlet? Finally, John Updike makes an appearance in this list with Gertrude and Claudius – a novel which takes the story all the way back to its Amleth roots. The characters’ names and time period appear to change in each section, but the backstory for the two complicated monarchs is a superior examination of character. Keep an eye on http://www.folger.edu/studyguides for our upcoming guide for Hamlet, which will include many more resources! Where do you go to examine these characters in the classroom? April is Hamlet month this year at the Folger! Our upcoming performance, opening April 21st, has us so excited for the Bard’s Greatest Tragedy! The play has been examined in a myriad of ways, so instead of trying to cram it all into one entry I will begin with notable performances of Hamlet. starring Jude Law, which was called “athletic,” “electric,” and “full-throttle.” Hamlet is very often seen as a thinker; an inactive, introspective, indecisive young man – but this Hamlet was charged with action and feeling in a world filled with shadows and dark voids. For all his thoughtfulness, Hamlet is a compelling character, one whom many actors have portrayed both on stage and in film. Notable film adaptations include the staged 1964 version starring Richard Burton and John Gielgud, Kennth Branagh’s 1996 epic, Franco Zeffirelli’s 1990 rough-edged period piece (also known as the “Mel Gibson” Hamlet), and Michael Almereyda’s 2000 modern take starring Ethan Hawke. Each of the actors playing Hamlet on film bring something different to the table: quiet contemplation, frenzied inner struggles, and cold calculation among them. Each Hamlet is searching for the character who has remained a puzzle to actors since Richard Burbage recited the role in the 16th century. Sarah Siddons was the first actress to take on the role in the 18th century, but was not the last. Many famous actors like Edwin Booth and David Garrick took up the mantle of the troubled Dane to great acclaim from their peers. A college colleague, Megan Reichelt, introduced me to this poem by Carl Sandburg that seems apt to this discussion: What is it about Hamlet that keeps actors asking questions, and what makes his character so interesting to portray? Which portrayal of Hamlet that you have seen was of particular interest to you, and why? “THEY all want to play Hamlet. A Midsummer Night’s Dream: Lord, what fools these mortals be! All’s Well That Ends Well: Go to, thou art a witty fool. Antony and Cleopatra: Out, fool! I forgive thee for a witch. Hamlet: Thou wretched, rash, intruding fool, farewell! Julius Caesar: What should the wars do with these jigging fools? King Lear: Dost thou know the difference, my boy, between a bitter fool and a sweet fool? Macbeth: Why should I play the Roman fool, and die on mine own sword? Othello: Thus do I ever make my fool my purse. Romeo and Juliet: O, I am fortune’s fool! The Taming of the Shrew: Away, you three-inch fool! I am no beast. The Tempest: Was I, to take this drunkard for a god and worship this dull fool! But wise men, folly-fall’n, quite taint their wit.